Did I mention I love headphones? So as a person who loves headphones, I’m constantly on the look for the perfect next pair. 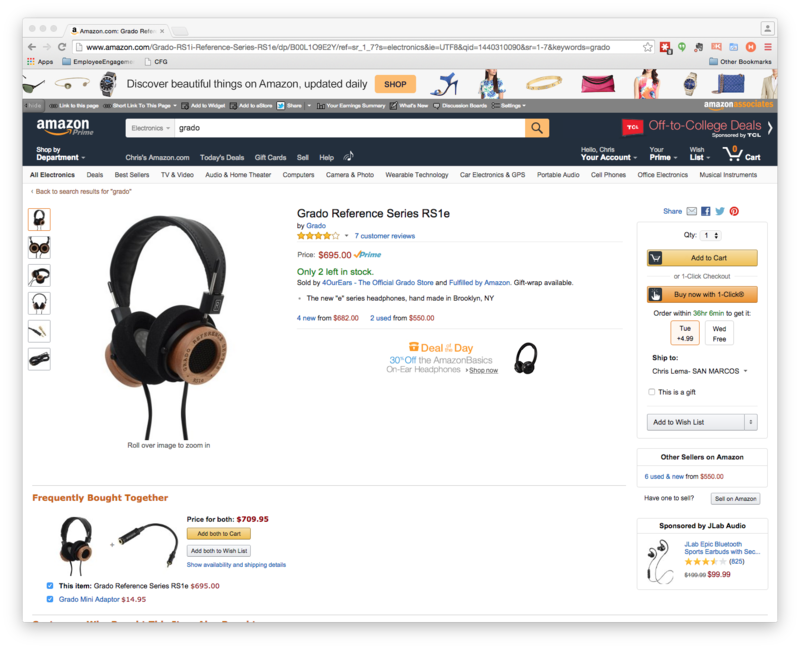 The holy grail search for the perfect headphones in every kind of situation. And of course, I’m starting to think that it will never happen. But I press on. My latest pair, which I got just this week, were a pair like the ones above – though a slightly different model, a limited edition Grado (Heritage Edition, GH1). What I noticed, on this page on Amazon, was the sale of the Mini Adapter for $14.95. And that’s what inspired me to spend my night writing about upsells, cross sells and bundles – particularly for WooCommerce. 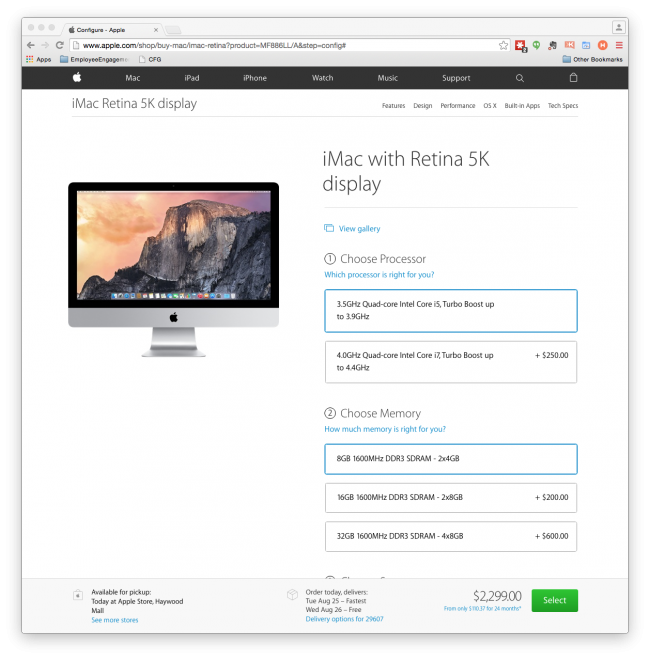 Upselling performs 20 times better than cross-selling when it comes to product pages. The word upsell starts with “up” so you can likely guess that it’s a recommendation to spend more. Normally, this is done by showing you a slightly better edition of what you are looking at. As you can imagine, it’s hard to upsell a premium product like the Grado headphones. But what if you were looking at a different pair? 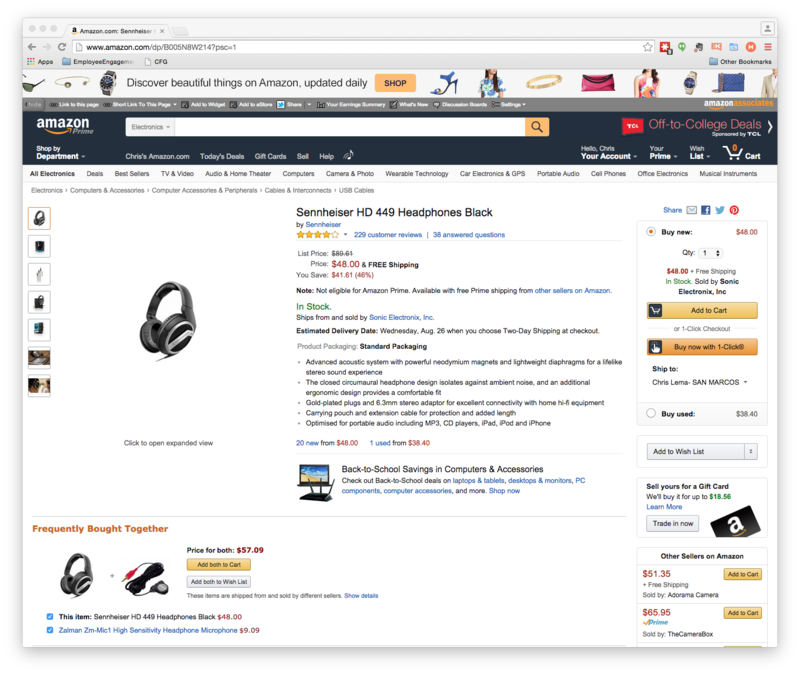 If you were looking at the Sennheiser HD 449, the reality is that you could easily find headphones that were more expensive than $48, right? 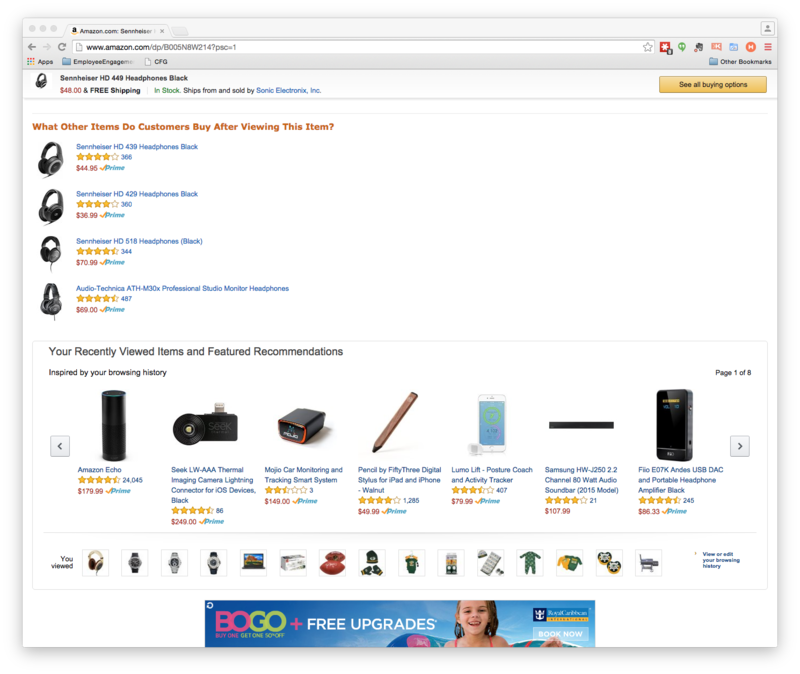 For example, if you scroll down to the bottom of this product’s page, you will see one of the ways Amazon does an upsell. That’s an upsell. The notion is simple. It says, there are similar but better options for you that you may want to consider. My favorite upsell comes from Apple, in the “config” part of purchasing a computer. Check it out. It’s like it’s telling you – hey, you could purchase this model, but wouldn’t you prefer adding a faster CPU and more RAM into this computer? When done in the checkout process, as part of “configuring this computer so that it’s more yours” – it works! 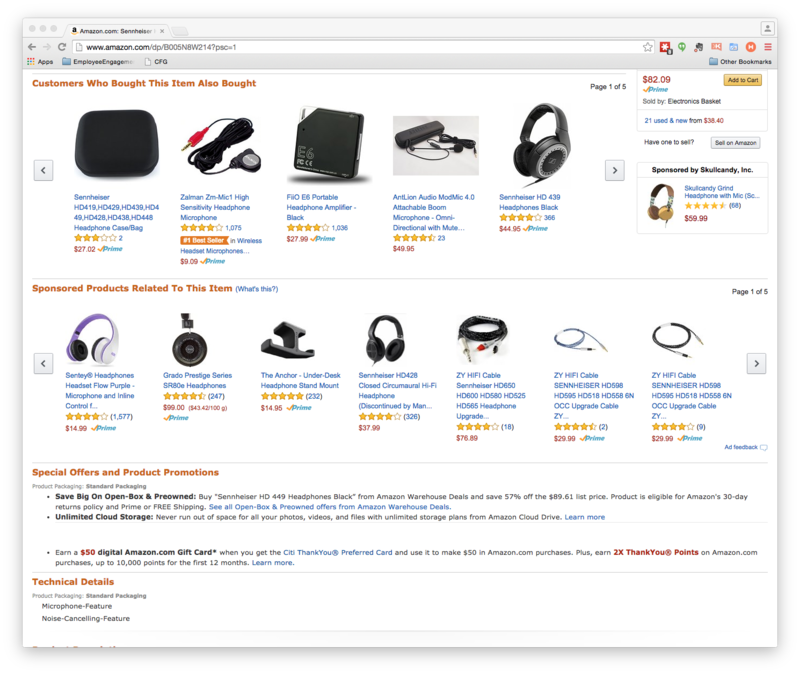 Here’s a great article about Upselling from ConversionXL (“How To Boost eCommerce Sales With Upselling”). 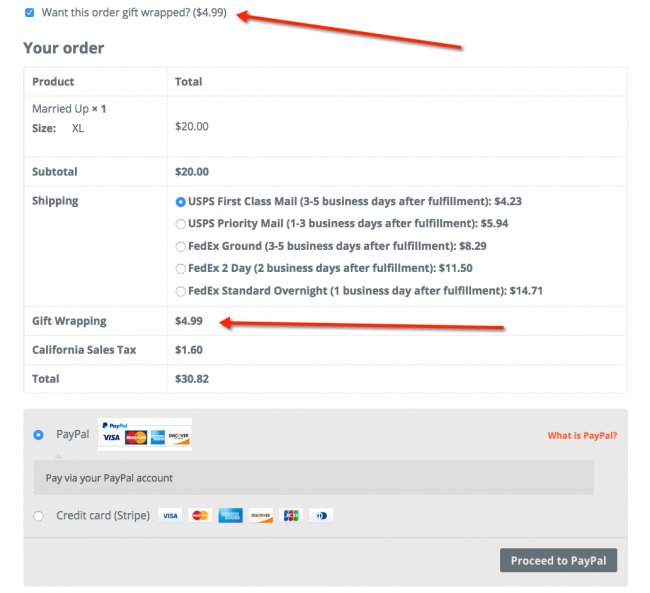 Is a bundle an upsell? In both cases of the Grado and the Sennheisers headphones above, you will see an offer right below the product image. Amazon says, “Frequently Bought Together” and shows you some additional things you can purchase. This is often a slightly different case of what’s called a Bundle. In many stores, a Bundle is offered with a slight discount. You could buy product A for $400 or buy product A ($400) and product B ($25) for a bundled price of $415. But Amazon doesn’t even discount all their bundles because they don’t need to. Their offering the bundle as something to help you. And that’s one of the big rules of bundling, upselling, or cross selling – the offer has to be helpful. The point of a bundle is to offer two highly related products. And much like the rules of a cross-sell, like we’ll see below, the additional bundle items ought to be low in cost (in relation to the main item) and (if you can do it), high in margin. In the case of headphones you’ll often see offers for things like cases. So if you’re thinking of spinning up a store, you’re likely going to check it out. And then you’re going to start wondering about all these options to generate a tiny little bit more money, simply by using upselling and cross-selling techniques, right? 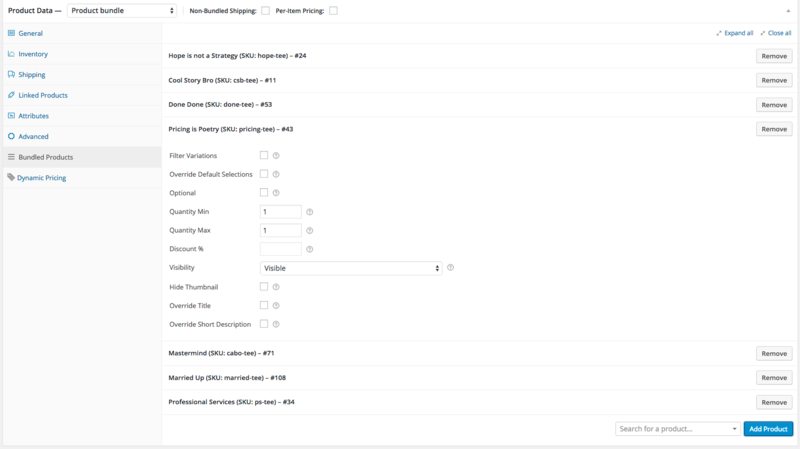 WooCommerce has several extensions that will help you with this – and I wanted to share them with you today. I don’t know if you know, but I run a little t-shirt store with a set of t-shirts for sale that have my quotes on them. You can easily imagine me wanting to create a bundle that would let me sell you a complete wardrobe. And the good news (though I haven’t done it yet), is that I can easily do it by creating a bundle product using WooCommerce Product Bundles. The first helps you with cross-selling and the next three are more focused on bundling (in different ways). Thankfully, rather than going into detail on how the last three differ from the one above, WooThemes has created a nice article explaining the different. The good news is that you don’t need the four above if you’re good with the two I’ve recommended. But the two I’ve recommended may not be perfect for your store, depending on what you’re selling (and how you’re selling). Which is why you should at least know that these others exist. Here’s maybe the best news of all. If you don’t want to do upsells from the cart, or bundles – both of which I’ve shown you here – and you only want to do upsells on the product details page and cross-sells on the checkout page, then WooCommerce does that straight out of the box. For free. You can read the documentation right here. And the best option available? 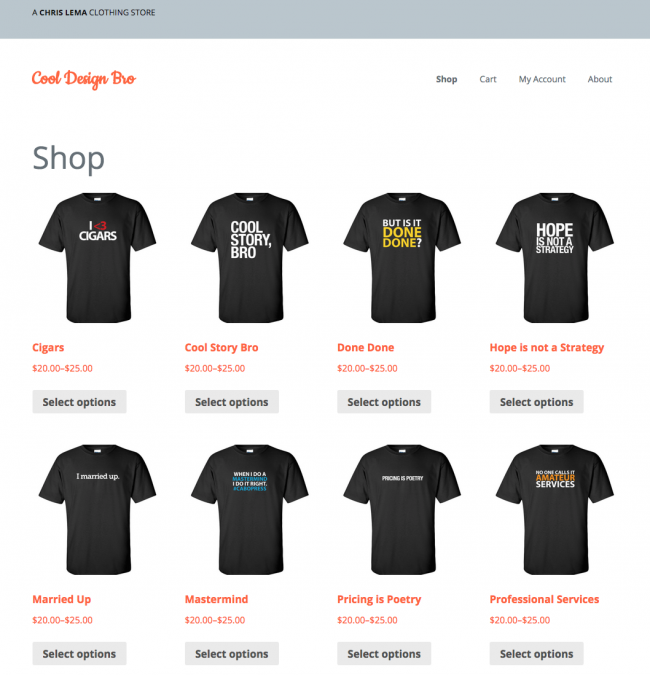 Automated upsells and cross-selling is where it’s at. When organizations move to automation, so that the internal staff don’t have to do the work of figuring out which are the best upsells and cross-selling products to offer, that’s when things really picked up. In the ConversionXL article I mentioned above, companies that moved to automated upselling and cross-selling saw increases of 30-70% in revenue from shopping carts. If you connect your eCommerce platform (like WooCommerce) to your email system (like ConvertKit), you can create autoresponders that send automated upsells for you! Check out my description of ConvertKit to see what I’m talking about.